Depending on how involved you plan to get in clipping and using coupons determines which coupon organization system works best. For beginners, this can be a simple method which can be adapted over time as coupons begin to accumulate. Using materials you already have around the house to set up the coupon files is the most cost effective direction to take. Keep it simple. Filing coupons in a shoebox can be a good start. As you clip the coupons, circle the expiration date with a colored pen or highlighter. File the coupon in the appropriate envelope alphabetically by the brand name. Be consistent with your filing system so that you will become comfortable using it. When you begin to collect a small bundle of the same kinds of products, organize them by date, putting the earliest expiration date first. Paper clip together and file. For coupons that have expiration dates in the following year, circle those dates with a different colored pen. This will allow you to have a fast system for determining which coupon will be used first. Using the coupons which expire soon and saving those with later expiration dates will help you stockpile your coupon collection. As your couponing strategies grow, so will your filing system. Many long-term coupon clippers keep two boxes, identically set up, but one is used for storing coupons and one for trading coupons. Trading coupons are those coupons collected for the purpose of trading with friends and family or on coupon trading lists. Advanced coupon clippers who are familiar with using spreadsheets such as Excel may input the coupons' information into the spreadsheet for quick reference when comparing coupons to grocery store fliers, or when making their shopping lists. When shopping, some people bring their entire coupon box to the grocery store. 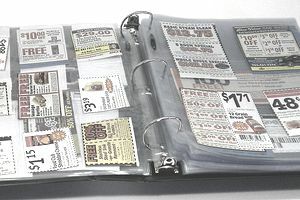 Other people like to pull out just the coupons they plan to use and file them in a more transportable and less cumbersome file to take to the store, such as a small accordion file. Other couponers may separate food products in one box and beauty and health products in another. As you become more comfortable using coupons, you will find a system that works best for you. The important goal is to develop an easy process that is easy to stick to and manage. What to Cut? What to Toss? There are different considerations to think about when deciding on which coupons to cut and which to ignore. Some coupon clippers will clip every coupon they see and trade those they don't use with other couponers in exchange for coupons they want. For beginner coupon users, it is best to avoid being overwhelmed by keeping a lot of coupons for products not normally purchased. Cutting and clipping coupons only for products you plan to buy will help keep your file clean and easy to use. Using the coupons is the ultimate goal here so you can reap the financial benefits of knocking down the grocery bill. Coupons for trading can always be saved later once the basics of couponing become more familiar and comfortable.